I confess: I'm not on the Design Team schedule this week at Pattie's Creations Design Challenge. But when I saw the theme - FOR A LITTLE GIRL....how could I pass this up when I have four granddaughters? So I asked if I could participate with Team Pattiboop, and the answer was YES!!! YEAH!!!! Don't think you can't participate if you don't have a little girl in your life....because even as adult women, we all have that inner little girl who still loves "girlie" things so you could make a card even for your adult family member or friend too. 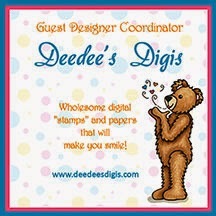 Come on over and join us at Pattie's Creations Design Challenge. Thanks for stopping by today! God bless you and, if you're from my neck of the woods - try to stay warm! What an adorable card! The bear is so cute and perfect for a little girl. This is so cute. Great paper and ribbon choice too. Zella - this is perfect for a granddaughter, especially since it's PINK!! Thanks for joining in with the new DT, I love seeing what you create! This way too cute! Thank you for joining us this week too. I love how you colored my "Bear With Balloons" image. It sure is cute for a little girl! Super sweet card Zella. Someone will be delighted to receive it. What a sweet card! Love all the pink! How sweet, Zella! This is so charming! Cute and more cuteness,beautiful design and amazing coloring. Lovely card! Thanks for visiting and leaving the sweet luv. Very cute Zella, love your bear and coloring!